Creative non-fiction is a blend of genres that takes the best of both and combines them into something great. It’s non-fiction, because it involves real-world research and aims to educate/illuminate people on a topic that the author is passionate about. It’s also creative, because the style of writing is story-telling in order to communicate the research topic in an entertaining and engaging manner. I’d done it here before; ie. Wormwood’s Apprentices and assorted posts featuring the Younger & Elder. I’ve often pictured it, in my mind’s eye, as a disheveled group of academics sitting around a roaring campfire, toasting marshmallows while sharing their latest research under the guise of ‘ghost stories’. 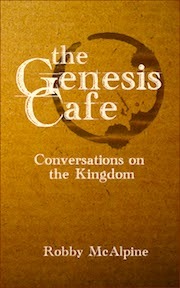 I joined the circle around the campfire — figuratively speaking — for the writing of The Genesis Café: Conversations on the Kingdom. The net result was the same: I was stalled. And so several thick binders of quotes, ideas, and research were shelved in my basement. That’s what writers do when stumped — move on for a season and come back to it with fresh eyes at a later time. As much as I wanted to put pen to digital paper, I was also loathe to write something that lacked originality and was simply a re-hash of what others had already said. Four years later, I had an epiphany of sorts: rather than deal with a broad range of scholars, I would zero in on just one. George Eldon Ladd had written one of the go-to treatises on the subject, and most of the other writers on the topic of the Kingdom made reference to Ladd’s ground-breaking work. He was the common denominator. I could take the creative non-fiction approach, delving into a layperson-friendly discussion on Ladd’s theology via two popular characters from my blog: the Younger & the Elder, and their supporting cast of the Crusty Irish Barkeep, the Barista, and a new character, the Proprietress. What followed was an intriguing and challenging adventure in research and creative writing. The demands of being conversant with Ladd’s work, in order to write authentically about it through fictionalized characters, was one of the most rewarding roller-coasters experiences for an author to enjoy. Creative non-fiction is a blast to write: researching and knowing your material inside and out, coupled with creating believable conversations between interesting characters, and not to overlook the challenge of writing good discussion questions for the end of each chapter — as a writer, it’s challenging, exhilarating, thought-provoking, muse-worthy, and exciting to see it all come together. Yes, it’s also time-consuming, brain-bending, and good ole-fashioned work, but the end result of The Genesis Café was so rewarding that all the required effort just faded into the distance. Creative non-fiction: where research becomes readable. The Israelites, for example, wandered through the desert from Egypt to the Promised Land, led by the pillar of cloud by day, and a pillar of fire by night (Exodus 13:21). When Solomon dedicated the temple, the presence of God was so tangible that the priests couldn’t even perform their duties (1 Kings 8:10-11). Conversely, there is a chilling vision given to Ezekiel when God withdrew His presence from the same temple, years later, due to corruption (Ezekiel 10:4-18). All that to say: the presence of God is a Big Deal. When I was a fairly new believer, we tended to use different language to describe our experience of God’s presence. Terms like “on fire” versus “cold”, for example. ‘Cold’ was probably an allusion to Jesus’ warning: “the love of most will grow cold” (Matthew 24:12), while ‘on fire’ was mostly likely inspired by the two disciples on the road to Emmaus: “were not our hearts burning?” (Luke 24:32). I can recall a few times, as a teenager, when I would suddenly become aware that my heart had grown cold. I hadn’t ‘backslidden’ into a life of wanton debauchery or anything like that, nor was I defiantly shaking my fist at the Almighty. I was going through the usual motions of an average high school student who also attended church, but my heart had gradually grown cold. The Spirit was always present, but my cold (distracted, inattentive) heart meant that I wasn’t aware of Him. Until I realized what had happened, and changed (repented). There’s also those times where you have a sense of His presence being “on” something you are involved in. I recall instances in pastoral ministry where I was faced with a difficult meeting with difficult people, and would spend a lot of time leading up to said meeting in Scripture reading and prayer — for truth to be spoken with love and respect. And yet despite the normal anxiety, I would enter the meeting with a definite sense of His presence going with me. There would inevitably be some level of fireworks before the meeting was over, but the resulting positive fruit was a testimony to His faithfulness to open and change hearts. Conversely, like Ezekiel’s vision of God’s glory departing from the Temple, there are times where you sense the absence, or even the withdrawal of His presence — some people colloquially describe it as: “God’s not on this”. That can usually be understood or interpreted as one way the Holy Spirit warns us to not get involved, or when it’s time to walk away. 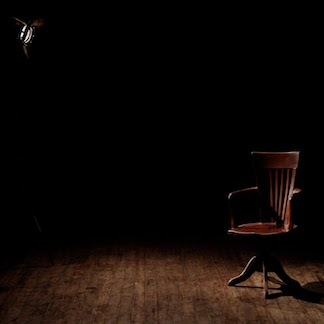 There was a time when I was asked by a church to do something that — no matter how I tried to look at it from multiple angles and viewpoints — I knew wasn’t what the Spirit was directing me to do. The direction the church leadership insisted that I follow wasn’t anything illegal, unethical, immoral or even unbiblical. They simply wanted me to strip out all elements of worship or overt discipleship from a ministry that I was leading, and to focus on ‘purely social events’. There’s nothing wrong with social events, naturally. I love having fun with friends as much as anyone. ‘Community’ is one of our deepest desires, and social gatherings are a natural expression of relationships. So, again: the leadership of the church was not asking me to do anything illegal, unethical, immoral, or unbiblical. But from the moment the directive came down — the proverbial ‘line drawn in the sand’ — I sensed the immediate withdrawal of the Presence. As sharply as if a guillotine had dropped. It’s one thing, as a teenager, to suddenly realize you’ve gradually cooled-off in your awareness of God’s presence. It’s another thing entirely to sense the withdrawal of the Spirit’s presence, and continue on as if nothing significant had changed. I resigned my position at the church not long afterward. I am not suggesting or implying that the Presence was withdrawn from the entire church in question — far from it. God is clearly at work there. I am speaking only of my individual following of His leading in one specific situation. God’s presence — and our awareness and cooperation — is an integral part of what it means to be “led by the Spirit” (Galatians 5:16-25). Whatever the cost may be, count me in.